I’ve been absent from this blog so long that I had to reset my password! I am appropriately abashed and will endeavour to rectify my behaviour!I’ve had posts I’ve wanted to put up for a while, but I guess I just didn’t have the right motivation… until now! Now, ladies – and yes I’m speaking directly to the ladies here – you know our lives can get crazy. We hold it down at home, we make it rain at work, look fabulous when out with friends and still manage to squeeze time in for spa days, family lunches, studies, gym, knowing the dialogue of Dirty Dancing offhead… you name it. Can we get a round of Beyonce’s Run The World (Girls) here? Our lives are demanding, and sometimes, at the end of a long day, a cup of herbal tea just does not cut it. I always suspected I wasn’t the only person who kicked off her shoes and poured a glass of red as soon as she got home after a particularly trying day. The good people at Ultra Liquors clearly understand it, and had the inspired idea to hold Johannesburg’s very first 100 Women, 100 Wines event at The Maslow Hotel on Friday 1 November. 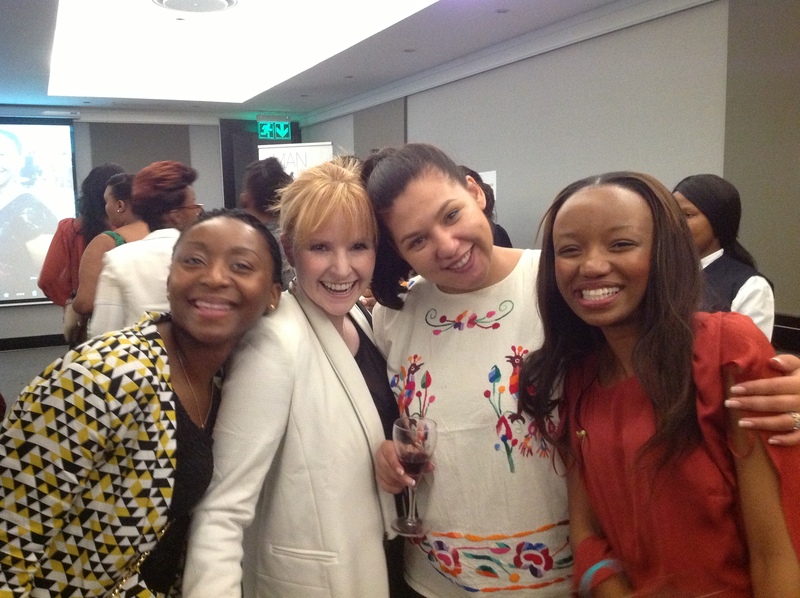 This being a ladies event, Iman Cosmetics and Ndalo Media were also there, bringing some extra glam to the function. It turns out that 80% of wine purchases are made by women. So this was really a pretty inspired decision they made – get 100 women and 100 of the wines they’re considering putting on their shelves in one room. Get the women to taste and vote for their favourite wines, and next time we stroll into Ultra Liquors we’ll see the wines we chose on the shelves. Works for me! So, the method to what would soon turn into madness – before we went into the tasting room we were asked to pick a wine glass from a table of 100 glasses. Each glass had 10 coloured stickers in it. Purple being my signature colour I grabbed a glass with the little mauve-coloured stickers and allowed myself to be ushered into the tasting room. It had been divided into 10 tables, each of which had a theme, such as Girls Night Out, Pasta Party, Special Sipping and Special Occasions. 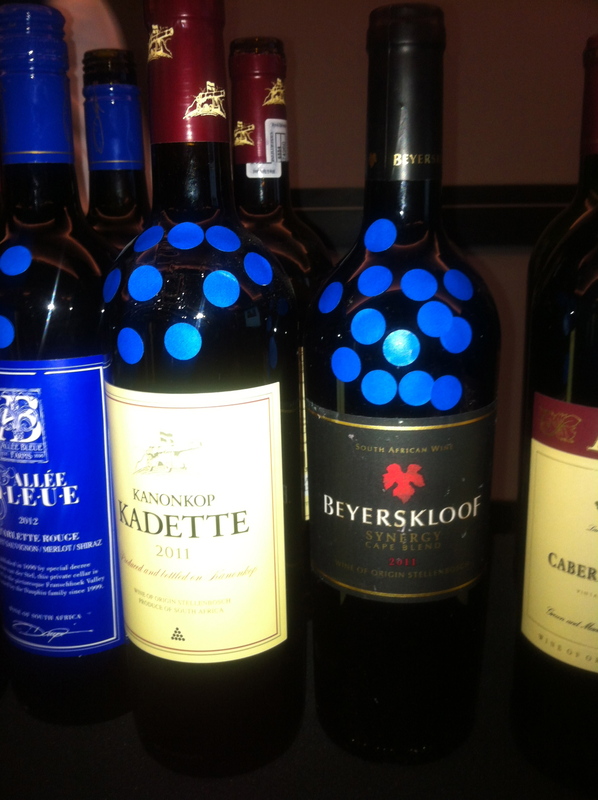 The host explained what we’d be doing – 10 of us would be assigned to each table; we’d have a limited duration of time in which to taste the wines on our tables, and were encouraged to affix stickers to our 10 favourite bottles. The fates spoke, and the purple stickers were assigned to the table designated “Working Week”, with the lovely Mantombi serving our tipple. The gong (figuratively) sounded and we were in business! Everyone at the table had their own strategy… my friend Aleta declared her intention to work through the wines as they were set out on the table; Marilyn started with the whites and worked her way through to the reds. I’m a bit of a romantic, so I started off with the Bonne Esperance for good luck. After that I made a beeline to the red side of the table; I tend to prefer reds and didn’t want to grow weary of tasting before I got to them. I took the task very seriously indeed! After all the future wine shopping options of Johannesburg’s women were partly in my hands! I did not wear that mantle lightly friends. I jealously guarded my stickers and ultimately awarded but 5 of them. 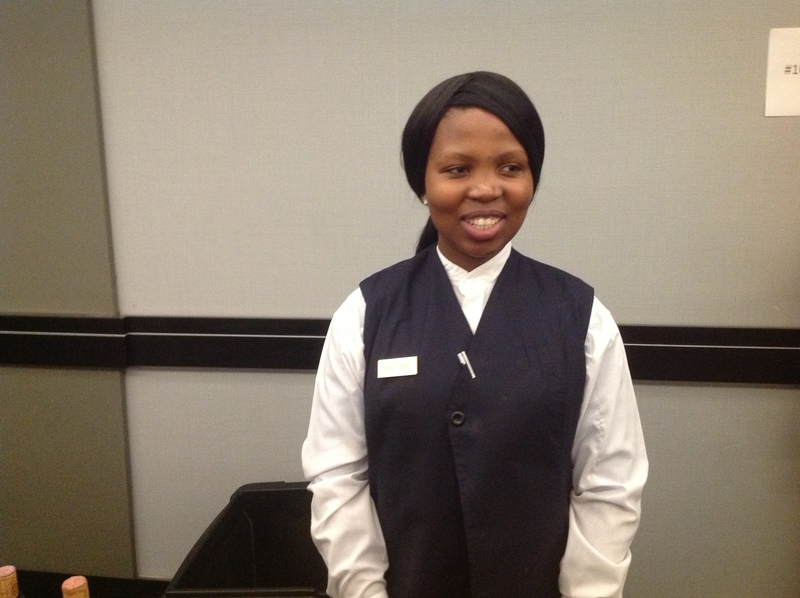 I would be remiss if I did not mention that there were some amazing ladies at the Maslow for the event! A bonus of this sort of function is the opportunity to mingle with people who have similar interests; I don’t know if I’m biased but the Working Week women were absolutely lovely (somehow I don’t have a photo of Thula who certainly came ready to have fun)! Once the gong sounded to end the judging, we were invited to go to the other tables and taste the wines the other 90 ladies had judged. Typical of me, I headed straight for the bubbles. 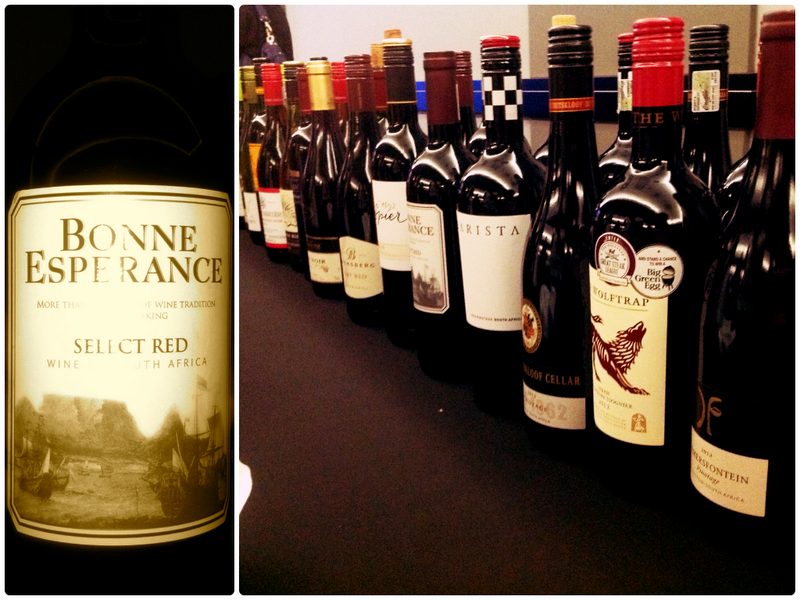 I wasn’t the only one with this idea, and I paused by the Winter Warmers table to see which wines had come up on top. A friendly Shayla pulled me aside and encouraged me to try two particular bottles which, as you can see from the numbers of stickers on them, won the Winter Warmers popularity contest. 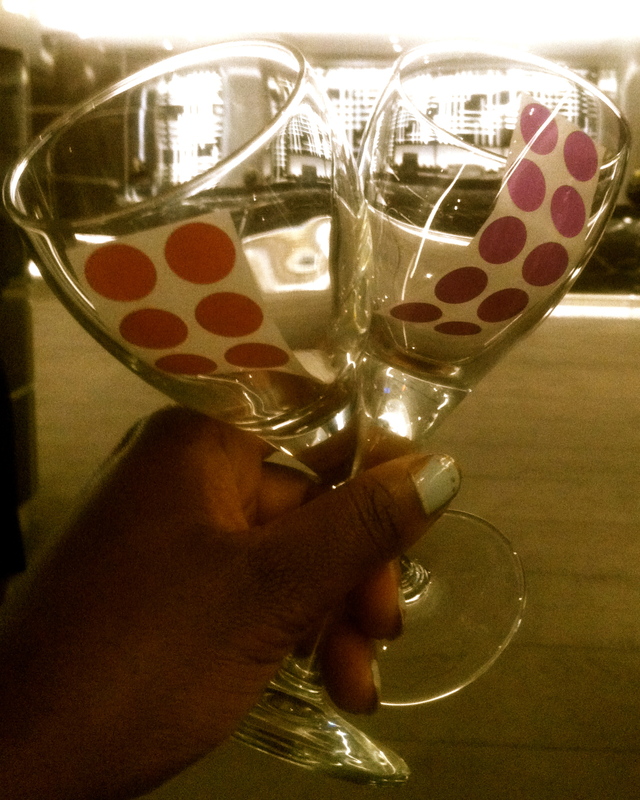 I did not regret my little detour – the wines certainly deserved their stickers! The surprises weren’t over yet! A lady with a notepad and an official look sidled up to me and whispered a code-word in my ear. Shortly thereafter, three other ladies and I were called up to to the front and it was announced that we had each won R500 Sorbet vouchers, courtesy of the Ndalo Group! What more could there be, you ask? Goodie bags, that’s what! Goodie bag contents! Red wine blend, white wine, Iman lip stain, Maslow stationary. Not photographed: Destiny Magazine, because I’m already devouring it. I just have to say, that Iman lip stain (“Sultry”) will look good on absolutely everybody. With all the different skin colours and tones you can come across that is an absolute miracle. I’m wearing it right now. Just because, even though I’m in my comfy clothes with my hair probably sticking up awkwardly, it makes me feel pretty. I walk away from this having met some really fun people and made great connections, with a new every-day lipstick, and with some extra tools which I can use when selecting wines for my next dinner party. It was an absolutely wonderful evening!